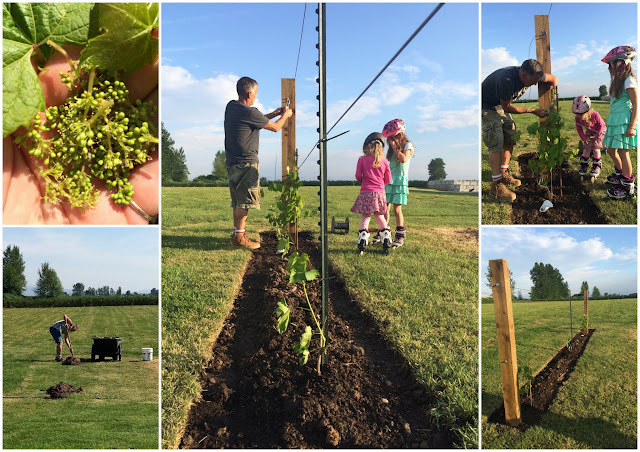 A few weeks ago we planted our first grape vines. It's mostly an experiment and we are hoping there will be some fruit in the years ahead that will be enjoyed by the grandkids who are always interested in what is growing in our garden. I couldn't help but think of the Jesus talking about being THE vine. He is not one of the vines but he he is "the vine". "Abide in me, and I in you. As the branch cannot bear fruit by itself, unless it abides in the vine, neither can you, unless you abide in me. I am the vine; you are the branches. Whoever abides in me and I in him, he it is that bears much fruit, for apart from me you can do nothing." It is a choice we can make to spend time in prayer, reading the Bible and focusing on Christ. We cannot bear fruit in our lives apart from a connection to the vine. Any good fruit we bear will be Christ's work in our lives and not something we ourselves have produced. The good news is that fruit is the natural result of abiding in Christ. Wonderful truth about our true vine, Lovella.